We here at Kayfabe Events are delighted that this November we are able to host a true former WWE Diva, Raw and Smackdown General Manager and wife of the late Eddie Guerrero. As with all Kayfabe Events, ticket holders will be part of a small audience, who will get an up-close & personal evening not to be forgotten! November 14th - Compered by WWEUK's Eddie Dennis, with the Q&A orchestrated by Chuck Mambo. During the meet and greet there will be a live podcast hosted by the voice of British Wrestling Dean Ayass, with our Friends from Dragon Pro with special guest Los Federales Super Santos Jr from the Anti Fun Police. We will also have with us former WWE Superstar Oscar from Men on a Mission joining us for a meet and greet and a special performance! November 15th - Compered by WWEUK's Eddie Dennis with the Q&A orchestrated by Chuck Mambo. Again during the meet and greet we will be hosting a live podcast hosted by the voice of British Wrestling Dean Ayass - guests to be announced! We will also have former WWE superstar Oscar From Men on a Mission joining us for a meet and greet and a very special performance!! November 16th - Compered by WWEUK's Eddie Dennis with the Q&A orchestrated by Chuck Mambo. During the Meet and greet we will be doing a live podcast hosted by the voice of British Wrestling Dean Ayass with our friends at British Empire Wrestling, and Bill Apter will be performing his one man Variety show! We again will have former WWE superstar Oscar from Men on a Mission joining us for a meet and greet and giving us a very special performance! November 17th - We have will be hosting an independent wrestlecon. Not only will Vicky Guerrero be the main event with her evening with, compered by WWEUK's Eddie Dennis with the Q&A being orchestrated by Chuck Mambo. - We will have a live round table from our friends at Riptide Wrestling! 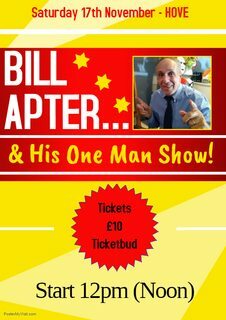 - Bill Apter will be performing his one man show, and doing a meet and greet! - Our friends at TWM News will be doing an exclusive live Podcast! - David Starr and Oscar from Men on a Mission will be joining us for separate Q&A sessions and doing meet and greets! - Finally, the current reigning Riptide Champion Chuck Mambo will be hosting a star studded end of tour blow out party not to be missed! MORNING TICKET HOVE - (1030 - 2.30) £15 This will get you in to both the podcasts, Bill Apters one man show, The riptide Round table and the meet and greets (Signings to be purchased separately on the day) for everyone except Vickie Guerrero, you will be asked to vacate the venue by 230pm. More announcements to follow with timings! Please note: CHECK THE TICKET DESCRIPTION TO SEE WHAT IS INCLUDED IN THE TICKET PRICE FOR EACH VENUE - IT DIFFERS DEPENDING ON THE DAY! Saturday's leg of the tour will be in the afternoon - with Bill Apter's One Man Show prior to Vickie Guerrero, and with Chuck Mambo's after party in the evening (all at the same venue). 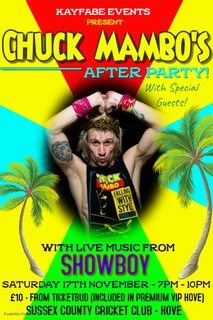 Tickets to see Bill Apter and entry into Chuck Mambo's After Party can be purchased separately. Please note: the TIMES at each venue - Hove has a different structure to the day and different times! ADDITIONAL SIGNINGS: ONLY available to premium and regular VIP ticket holders - £10 per each additional item. Limited edition merchandise will be available to buy on the day - keep up-to-date with developments via Twitter and Facebook. Licensed bar at each venue for refreshments - On Saturday in Hove there will be a cafe available for the day.